Note 342 – Can writing promote everyday happiness? But, which is the best way, or is it different for each person? Which method encourages more feelings of happiness? 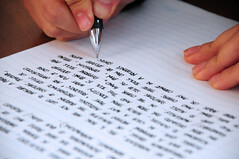 Research detailed in the book suggests that the act of writing down thoughts can be used to promote everyday happiness. My thoughts: As I am a writer and also someone who has kept diaries/journals (i.e. written down my thoughts) for most of my life, I can relate to this concept and most certainly do think that it can promote everyday happiness; however, a non-writer might not feel the same. Do you think that writing can promote everyday happiness?